I have to start this post by saying that my all-time favorite candle is Capri Blue Volcano. It's hands-down the best smelling smell that I've ever smelled! And I love that I'm not alone here... When I posted about these candles on my stories, so many of you said that it's your favorite as well. It's also my husband's favorite- I got him hooked too ;) . 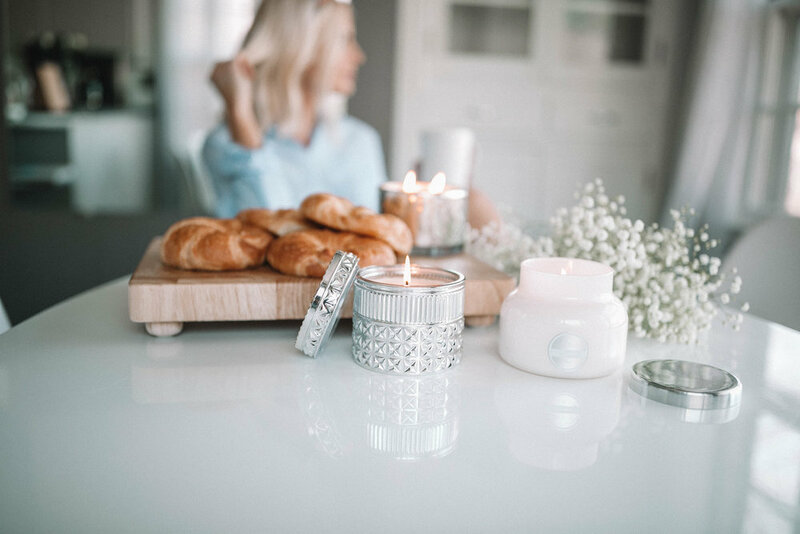 I've been purchasing and re-purchasing these candles for years, but I love that my favorite scent now comes in the form of hand soap, room spray, lotion, perfume, and more. I'm also starting to try out other scents! I recently started lighting the Citrus & Violet Haze and it smells sooo yummy. Not to mention the gilded jar is gorgeous! If you haven't tried Capri Blue's candles yet, you're missin' out! They're sold at lots of stores such as Nordstrom, Anthropolgie, or directly from Capri Blue's site. Okay now that I'm done professing my love to Capri Blue.. 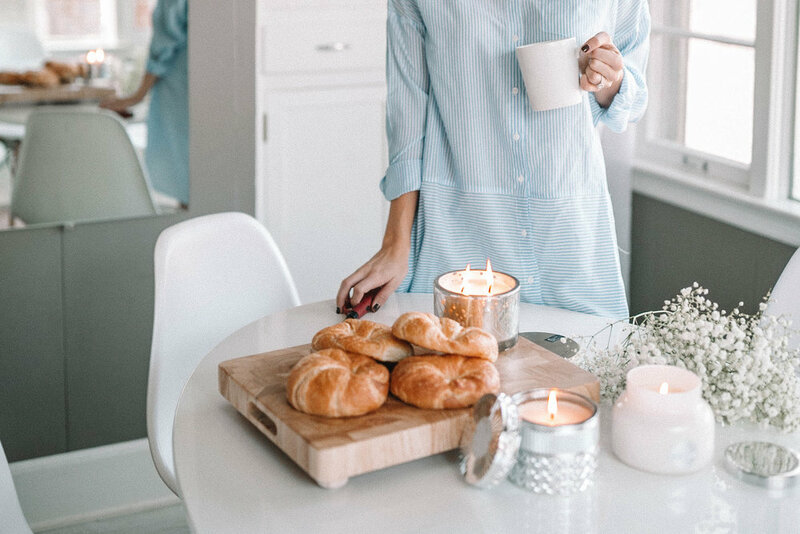 I'm going to share 3 ways to make your mornings more peaceful and cozy. Our mornings set the tone for the whole day so it's important to start them off in the best way possible. Here are 3 habits I've adopted that have really helped me have better mornings! 1. Put the phone away- It's so easy to lay in bed and waste away 45 minutes scrolling through IG or catching up on news or emails. I try to keep my phone in another room so I can have a peaceful morning and not let life's craziness be the first thing that I see when I wake up. 3. Set your mind for the day- There are so many ways to get your mind set for the day. You can write a list of things you're thankful for, meditate, journal, pray, read an inspiring book- the list goes on and on! I find that taking some time in the morning to pause from life's distractions makes a huge difference in my day and my happiness level! There you have it! Of course, not every morning is going to be peaceful and perfect. Life happens. But for all the other days, this is how I love for my morning to start! I hope you guys enjoyed this post! You can shop my jammies below and I linked a few similar pairs because mine are almost sold out! 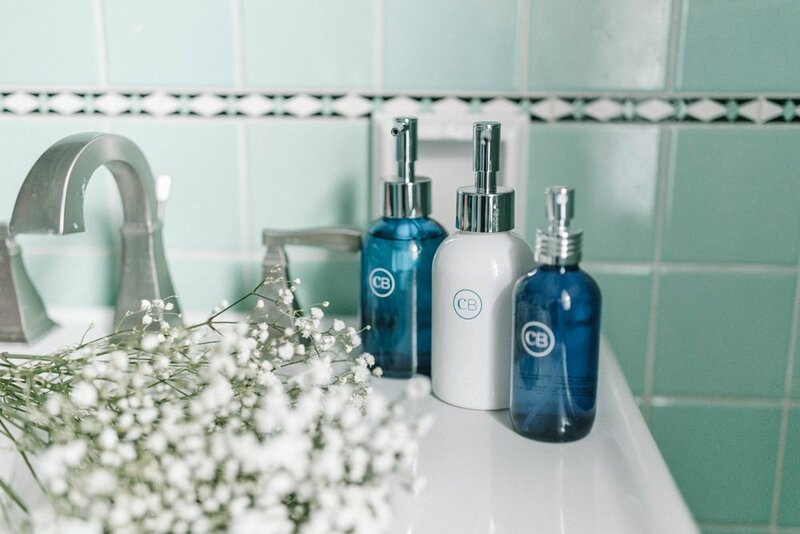 I've also linked some of my favorite Capri Blue products below! Happy Tuesday loves! This post is sponsored by Capri Blue- as always, all opinions are my own and I'm so thankful to work with amazing brands I love!